People love Vermont for its distinctive landscape. The patchwork of mountains and river valleys, camps and villages, farms and forests, speaks to a love of nature, community, and self-reliance. That we value these things is clearly visible in our support of farming, but the value of working forests remains a mystery to many. We want to change that. Today, the loss of family dairy farms is being paralleled by the closing of sawmills and a decline in forest-based enterprises. Forestland that has, for years, been managed for sawlogs and fuel, is today going unmanaged, or worse, being parcelized and developed in a way that undermines the look and feel of Vermont. 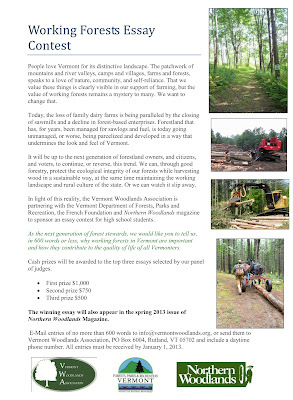 In light of this reality, the Vermont Woodlands Association is partnering with the Vermont Department of Forests, Parks and Recreation, the French Foundation and Northern Woodlands magazine to sponsor an essay contest for high school students. Have you ever driven Rt. 108 though Smugglers Notch and looked up and seen people hanging off the rock some 300 feet in the air? 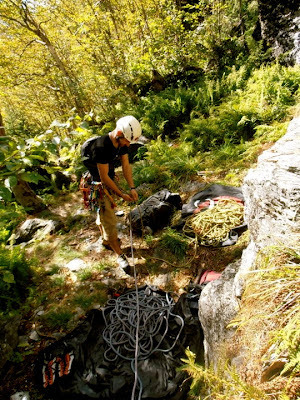 This weekend many people saw two local climbers doing just that. They were climbing a section called the Quartz Crack, which is climbed in 4 pitches (4 sections) and was 340 feet long. Ranging in difficulty from 5.6- 5.9. Dylan Kunkel and Aaron Goldfield were cheered on the whole way. Here are some of their photos. Lunch, it’s a meal that tend to happen in the middle of the day, and is the filler between breakfast and dinner or for many people is like breakfast being their first meal of the day. It can be easy to forget about if you are in the midst and chaos of trying to plan for dinner, especially if you’re camping with a larger group of people and have to worry about. But when you are camping nothing should be stressful and everything should be quick and easy. Here are some delicious meals you can prepare for ahead of time. Enjoy! Taco Bowls This recipe is very flexible as you can prepare as much or as little as you would like. 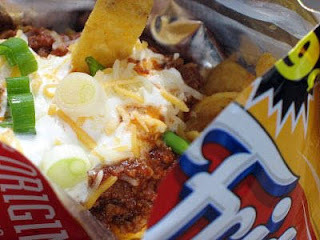 *Tip* Avoid washing dishes by using the chip bag as your bowl. Invasive Pests Take Notice: Vermont State Park visitors are on to you! 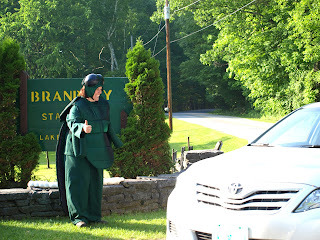 Branbury State Park visitors were surprised to see a giant Emerald Ash Borer running through the campground recently. The invasive pest was looking for a ride in their firewood. The giant pest ran through the campground trying to hitchhike, but no one would offer up a ride! That’s because the Park Interpreter Rachel was there to inform campers that the Emerald Ash Borer is a BAD BUG and you shouldn’t help it move from one place to another. - and a bear steal steaks and a gallon of milk from a camper’s cooler. On the upside, there were most certainly more positives than negatives. Except for a few minor snafus and set backs along the way, it was a great season. We had a great staff and overall, great park guests. We were paid many compliments in regards to how much the park has improved over the years. And new guests loved the park as well. There is Something in the Air at Mt. Philo State Park and You've Got to Check it Out! Its hawks. Lots of them. You know Mt. Philo State Park is a great place to hike, but did you know that it is also a great place to watch the annual fall hawk migration? If you’ve never seen a hawk cruise by at eye level, now is your chance to witness one of nature’s most exhilarating sights. 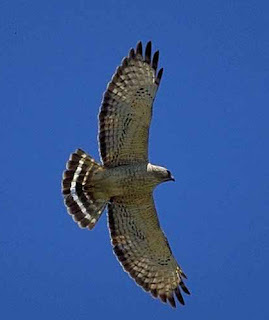 Raptors of different species migrate from August through November, but the most dramatic migration to watch is that of the broad-winged hawk. Beginning mid-September, when the weather is good and especially when the wind is from the northwest, they take to the sky and form large groups called “kettles”. The birds find pockets of heated air called thermals and slowly soar in circles as they rise to the top of the warm column of air. Then they glide to the next thermal and repeat the process. When many birds do this at once it looks like they are bubbling or boiling, thus the name “kettle”. Every year we award park of the year to one park in each region. The purpose of the program is to acknowledge exemplary accomplishments of the parks field staff, as well as for the enhancement of public service- to make the parks better, more enjoyable place to recreate. We do this to emphasize focus on group accomplishment. ®Staff mustdisplayoutstanding hospitality to all park visitors. ®Staff must maintain amiable, courteous, and respectful working relationships among themselves and with maintenance staff, concessionaires, contractors and others who may be working in the park. ®Staff appearance must be especially clean, neat and professional.